A Chinese poem reads: �a night shower will make many flowers fall�. As is known, ordinary grasses and flowers will become withered in strong winds and heavy storms, and scatter and fly around; however, there are also many extraordinary phenomena in nature beyond our imagination. For example, there is a kind of peculiar plant in Xishuangbanna that likes bursting open in strong winds and heavy storms. Its flowers are pink, growing in groups and bunches, and look like burning fires during the rain. They blossom wildly, and people may feel dizzy at the sight of them. Therefore, the flower is called red rain lily. It looks like Chinese chives. It has green leaves, which suspend in the air and nearly touch the ground surface. Red rain lily has its native land in Mexico and Cuba of America, but we may find many of its brothers and sisters in Xishuangbanna of Yunnan. Ardent local Buddhist believers, particularly the Dai folks, like red rain lilies very much. They worship red rain lilies and regard them as holy flowers; therefore, they often contribute red rain lilies in front of the stature of Buddha. 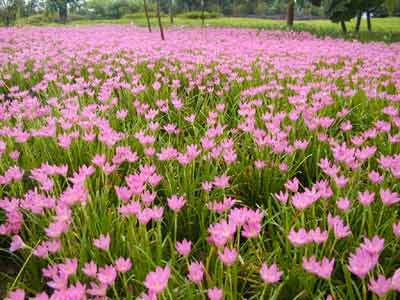 In the tropical rain forests of Xishuangbanna, people sometimes may encounter the miraculous view when red rain lilies are in full blossom. The weather in Xishuangbanna changes very quickly. The sun may shine happily for a moment; but after a short while, heavy clouds may cover the sun; then winds will be strong, and thunders begin to rumble. People have to hide in tree holes or caves for shelter, and small animals such as red deer will run to and fro for fear of the howling, and some even bump to faint on trees because of anxiety. The cracking sounds of broken trees keep to be heard one after another. A shower may soon pour down, and the whole forests soon become a world of water. But easy come, easy go. The rain will stop in a sudden, and people around find it amazingly that: almost all red rain lilies are in full blossom, as if they are vying with one another. The scene is like when an artist spills his red paint bottles; roadsides, banks of streams, and mountains cliffs all turned into red immediately. One may wonder for what reasons the red rain lilies like blossoming in high winds and heavy storms. The answer is: when the temperature is high, the air pressure is low, so there will be a lot of evaporation; the blooming hormone in the bulbs of the red rain lilies will increase very quickly during this period, which will in turn stimulate the growth of their buds and will make red rain lilies burst open in heavy tropical rains. Dear friends, we can not expect favorable wind all the way in our life; if you encounter any hardships or setbacks in your life, please follow the example of red rain lilies; in this way, you will become more optimistic and will lead a fruitful life!